It came around alot faster than expected but we have now handed in for the client project. Despite a recently blog on my christmas and session 13 work we was given a slight extension to our initial Tuesday hand in to the Friday due to some engine issues that with slight extra time would be implemented, also a lack of textures from most people was still to come in so we was grateful for the extra time. Despite that by now we should be tuned to deadlines having them done before the actual day so any fine tweaks can be made with little panic. With this slight extension it gave me some room to do some more work. I could have gone many ways to add to my work like texturing my car but I realised this process may need slightly longer and not to be rushed. So instead I re-addressed my textures from the whole process going back to my first buildings to improve the general look. When I went back to look at some of my early unwraps and textures it shocked me how far i have come in advancing my unwrapping and texturing skills. With some quick tweaks to early unwraps without redoing it all i made some more room for larger uv’s which means higher quality. One thing in particular lacking from some early buildings was that of doors and windows, early on we mentioned the idea of multi subbing windows to give a realistic reflection and look to the buildings but to do this we needed an interior otherwise you just see emptiness behind your building. I decided for now to apply some simple window textures which isnt as realistic but at least its not seethrough glass or a grey untextured area. Then for the doors most of my buildings are shops and with our setting being night time i just applied some shutters so imply its closed and locked up. 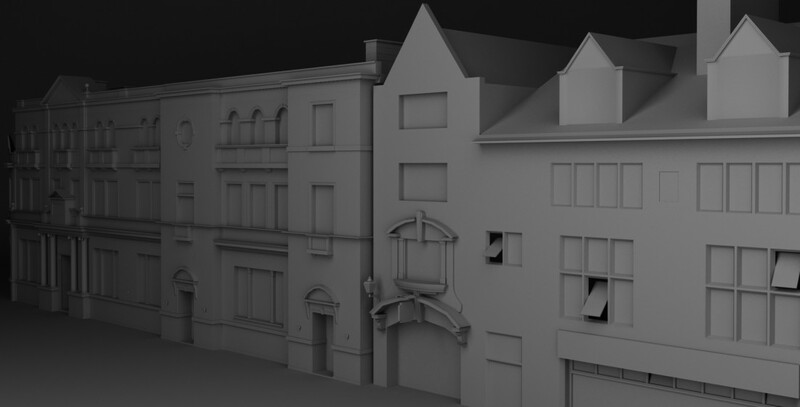 I was pleased with the outcomes of m&s, poundland and parliament street building probably because they are my later buildings to be textured i had a bit more knowledge to improve my work. With the other 3 being basic buildings not much could be done but correct stiching unwrapping has been done so cannot complain much just needs a bit of work. There was a minor issue with the windows on crawshaws they look very washed out and white also the bottom windows have some random shapes on them, im yet to figure out why this is its probably a quick fix once i figure it out though. Overall very pleased with my extra work done in the additional time and feel i am improving on the texturing with each piece of work i do. Next is to tackle unwrapping and texturing the cars for the level, this may take alot of time but it will get there and make me a better worker for it. Categories: Client Project | Tags: 1960s, 3D, 3D Model, Brief, Buildings, Client, render, texture | Permalink.